I want to use regions for code folding in Eclipse; how can that be done in Java? There's no such standard equivalent. 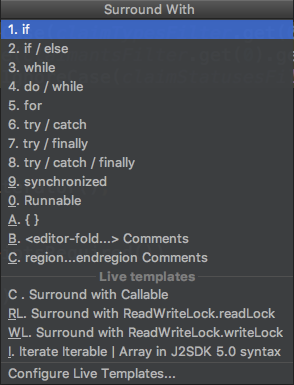 Some IDEs - Intellij, for instance, or Eclipse - can fold depending on the code types involved (constructors, imports etc. ), but there's nothing quite like #region. Jet Brains IDEA has this feature. You can use hotkey surround with for that (ctrl + alt + T). It's just IDEA feature. 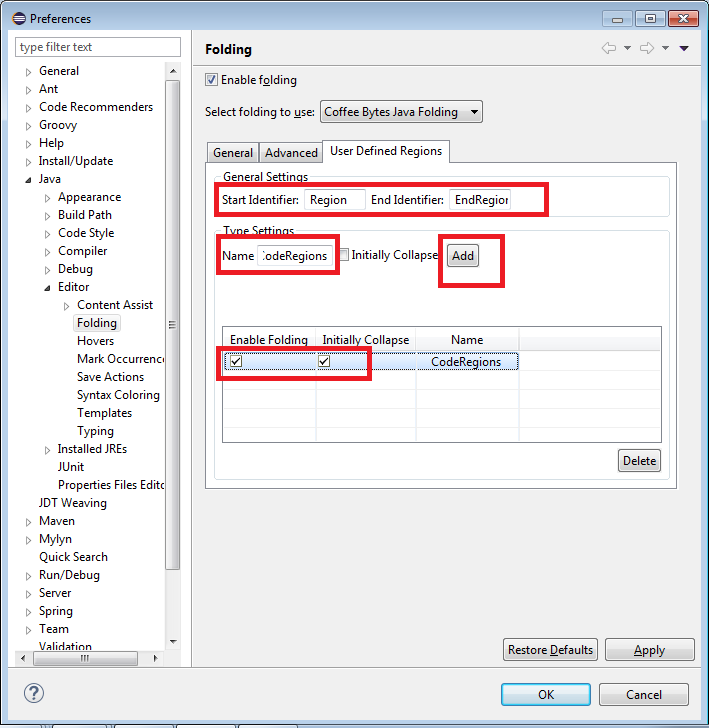 For Eclipse IDE the Coffee-Bytes plugin can do it, download link is here. Latest information about Coffee-Bytes is here. 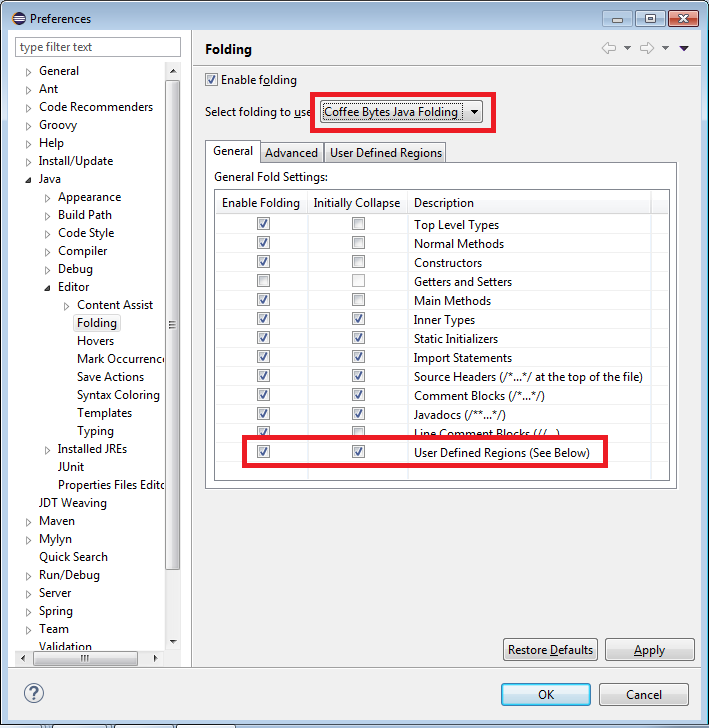 Custom code folding feature can be added to eclipse using CoffeeScript code folding plugin. You can download archive and find steps at this Blog also. As noted in the article, this may be supported by other editors too, but there are no guarantees. Contrary to what most are posting, this is NOT an IDE thing. It is a language thing. The #region is a C# statement. Tip: Put ";" at the end of the "endregion"
If anyone is interested, in Eclipse you can collapse all your methods etc in one go, just right click when you'd normally insert a break point, click 'Folding' > 'Collapse all'. It know it's not an answer to the question, but just providing an alternative to quick code folding. Really only gets you any benefit in the IDE. With Java, there's no set standard in IDE, so there's really no standard parallel to #region. I usually need this for commented code so I use curly brackets at start and end of that. It could be used for code snippets but can create problems in some code because it changes the scope of variable. Actually johann, the # indicates that it's a preprocessor directive, which basically means it tells the IDE what to do. In the case of using #region and #endregion in your code, it makes NO difference in the final code whether it's there or not. Can you really call it a language element if using it changes nothing? Victor Ruiz C.Victor Ruiz C.
There is some option to achieve the same, Follow the below points. Const REGION_START As String = "//#region"
Const REGION_END As String = "//#endregion"
5) Save the macro and close the editor. 7) now in textbox under the "Press shortcut keys" you can enter the desired shortcut. I use Ctrl+M+N. Not the answer you're looking for? Browse other questions tagged java c# eclipse folding or ask your own question. C-sharp's “#region” & “#endregion” in Java? What code folding plugins work on Eclipse 3.6? How to minimize code area in Eclipse? In Eclipse what can I use to encapsulate a block of code that I can toggle to view or not?